Jose Garces competing in finale of "The Next Iron Chef"
It's Jose Garces (left) vs. Jehangir Mehta (right) for title of "Iron Chef." On Sunday, Nov. 22, Jehangir Mehta, of the pint-sized Graffiti restaurant in the East Village, and Jose Garces, chef about Philly will battle it out for the ultimate culinary title, Iron Chef. And for the second time this month, New York will battle Philly for a championship. For Sunday’s final challenge on "The Next Iron Chef," the Food Network's spin-off of the American spin-off of the original show, designed for the express purpose of being a ratings machine, Garces, the owner/chef of five of Philadelphia’s top restaurants (Amada, Chifa, Distrito, Tinto and Village Whiskey) and Mehta will prepare five dishes each containing a secret ingredient that represent the melting pot that is American cuisine (the battle was taped months ago). Although both men have been tight-lipped about who the next Iron Chef is, something about Garces hosting a viewing party on Sunday (at Distrito in West Philly) makes us think he'll fair better than the Phillies did. But then again, we could be wrong. In any case, allez cuisine! 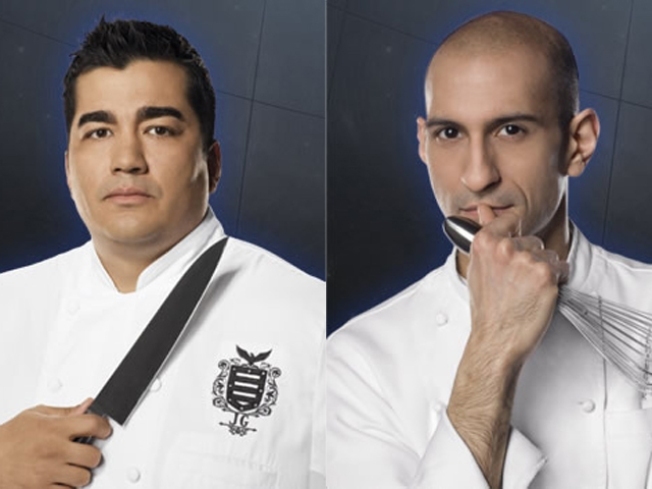 "The Next Iron Chef" finale airs on the Food Network at 9 p.m. on Sunday.